Mold Shields prevent your parts from scattering randomly within the mold’s open space by keeping them within the desired "drop zone". Mold Shields are a crystal clear plastic curtain which attaches to either side of the mold using magnets. As the mold opens and closes, the Mold Shields expand and contract to provide a curtain that prevents molded parts from falling outside the drop zone. The crystal clear plastic allows you to observe your molding area, and monitor your parts production in progress. With an in-service life expectancy of 3 million cycles, Mold Shields have a rapid pay back based on scrap reduction and increased good production output. 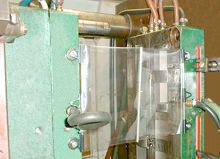 Since Mold Shields are easily attached and removed as necessary, they can be quickly moved from press to press to meet changing production demands or simply removed in seconds for equipment maintenance purposes. 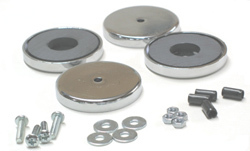 Mold Shields are easy to install and remove, with some assembly of hardware required. For larger applications, multiple Shields can be used on a mold. hardware and the required number of magnets. Copyright 1997 - 2018 Plastic Services & Equipment. All rights reserved.